Samsung's Galaxy Tab S is one of our current favorite tablets on account of the stunning AMOLED screen and thin design, but it seems that Samsung aren't content with keeping the Tab S as it was. It appears that they're upgrading the device with a new processor, removing the Exynos 5420 from the Note 3 and replacing it with the Exynos 5433 from the Note 4. This is something of an unusual decision because, apart from a little TouchWiz lock screen lag, we saw no performance issues with our own Tab S powered by the 5420. The Exynos 5420 is a dual quad core processor, that meaning it pairs up a high performance quad core processor for the heavy duty processor tasks with a high efficiency quad core unit for the lightweight computing activities. This is a typical big.LITTLE arrangement, which is a way of having our cheesecake and eating it too: it combines high performance with low battery use. The Exynos 5433 is also a big.LITTLE processor and it too pairs up two quad core processors, but it's a newer generation processor that's been fabricated with a smaller die size and more modern architecture. As is usual for processors, the newer generation is both quicker and more energy efficient; it makes perfect sense for Samsung to engineer the 5433 processor into the Galaxy Tab S devices. Or does it? 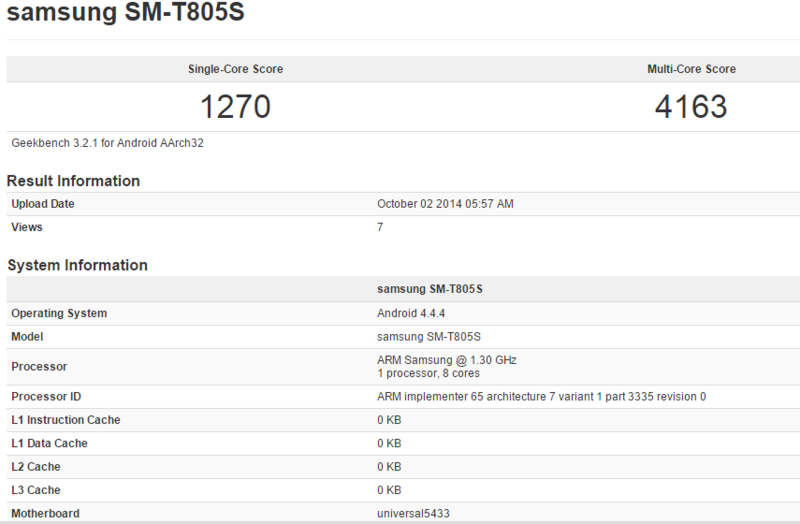 You see, as we've reported here the Samsung Exynos 5433 appears to be a 64-bit processor locked into 32-bit mode. And it's still a powerful processor and the Note 4's early benchmarks are superb. And yet... if Samsung have software-crippled the 5433 into 32-bit only mode for the Tab S, this is going to hurt the device compared with its competition once Android L is released. That's because Android L is the first version of Android that will support 64-bit processing. If the Galaxy Tab S is launched with a Exynos 5433 locked into 32-bit mode, this will not make a difference to how great the device will be in absolute terms, but it does mean that competitor tablets will likely gain a jump over the tablet this time next year when Samsung start updating their portfolio of tablets to later versions of Android. It wouldn't be enough to stop me from buying the Tab S and I can never recommend buying (or not buying) a device based on it might (or might not!) do at some point in the future, but it's something to watch out for. I might be worrying about nothing, because the revised Tab S is currently only being released in South Korea. Samsung often release upgraded devices in their home market and keep them exclusive for a few months, well guess what? In a few months we expect devices to be shipping with Android L. Perhaps Samsung will release a 64-bit variant of the Tab S across the world after Android L has been released? Or perhaps the Exynos 5433 will be released from it's 32-bit only shackles and will be able to flex some 64-bit muscle with the newer version of Android?